Leicester maintained their steady climb up the Championship table thanks to a fine win over Barnsley. Paul Gallagher's 30-yard strike set the Foxes on their way after 15 minutes. Andy King's delightful chip put them two ahead but a stunning curled effort from Chelsea loanee Jacob Mellis on the stroke of half-time made it 2-1. King grabbed Leicester's third with a measured 18-yard strike after a surging run and Kyle Naughton's spectacular 30-yard effort sealed the win late on. After a tame start at the Walker's Stadium, Gallagher brought the home fans to their feet when he sent an unstoppable right-foot shot inside the top corner. Wellens, who provided the assist for Gallagher, was at the heart of the action again as Leicester doubled their lead just before the break. The midfielder picked out Ayegbeni Yakubu and he in turn found King, who finished at the second attempt. Barnsley, who had a goal ruled out for offside moments later, grabbed themselves a lifeline in first-half stoppage time when Mellis' shot from the edge of the area found the bottom corner. But just as Barnsley were eyeing an equaliser, King scored his second of the game with a low drive from the edge of the box. Yakubu and Matt Oakley missed opportunities to put the game beyond doubt, before Naughton unleashed a superb long-distance effort to finish the match off. The win continues an impressive run of results for Sven Goran Eriksson's side, who have won five of their last six league games and are now up to eighth - just outside the play-off places. 90:00+4:16 The referee signals the end of the game. 90:00+0:02 Corner taken left-footed by Paul Gallagher from the right by-line, volleyed right-footed shot by Matt Oakley. Save by Luke Steele. Richie Wellens takes a inswinging corner. Foul by Hugo Colace on Richie Wellens, free kick awarded. Paul Gallagher takes the free kick. 90:00+0:02 Booking Hugo Colace booked for unsporting behaviour. 88:56 GOAL - Kyle Naughton:Leicester 4 - 1 Barnsley Goal scored by Kyle Naughton from 35 yards. Leicester 4-1 Barnsley. 85:38 Inswinging corner taken from the left by-line by Paul Gallagher. 85:23 Ayegbeni Yakubu takes a shot. Save made by Luke Steele. 84:18 The official flags Paul Gallagher offside. Free kick taken by Luke Steele. 84:18 Booking The referee books Andy King for dissent. 81:29 Free kick awarded for an unfair challenge on Jacob Butterfield by Matt Oakley. Free kick crossed right-footed by Kieran Trippier, Chris Weale makes a save. 81:29 Substitution Reuben Noble-Lazarus is brought on as a substitute for Jacob Mellis. 81:29 Substitution Souleymane Bamba leaves the field to be replaced by Jack Hobbs. 79:37 Jacob Butterfield decides to take the corner short. The referee blows for offside against Frank Nouble. Chris Weale restarts play with the free kick. 79:05 Corner taken by Jacob Butterfield played to the near post, clearance made by Ben Mee. 75:32 Free kick awarded for a foul by Matt Oakley on Jacob Mellis. Kieran Trippier takes the indirect free kick. 73:01 Substitution Jacob Butterfield replaces Garry O'Connor. 72:44 Effort from the edge of the area by Garry O'Connor goes wide of the left-hand post. 72:20 Patrick Van Aanholt challenges Kieran Trippier unfairly and gives away a free kick. Luke Steele takes the indirect free kick. 71:41 The referee blows for offside. Free kick taken by Chris Weale. 70:07 Souleymane Bamba fouled by Garry O'Connor, the ref awards a free kick. Chris Weale takes the indirect free kick. 68:38 Richie Wellens takes a shot. Save by Luke Steele. 65:06 Substitution (Barnsley) makes a substitution, with Hugo Colace coming on for Diego Arismendi. 64:08 Paul Gallagher takes a shot. Save by Luke Steele. 61:21 Substitution Matt Oakley replaces Yuki Abe. 61:21 Substitution (Leicester) makes a substitution, with Lloyd Dyer coming on for Darius Vassell. 60:23 Foul by Matthew Hill on Kyle Naughton, free kick awarded. The free kick is swung in right-footed by Paul Gallagher. 59:36 Matthew Hill gives away a free kick for an unfair challenge on Darius Vassell. Kyle Naughton takes the free kick. 57:49 GOAL - Andy King:Leicester 3 - 1 Barnsley Goal scored by Andy King from just inside the penalty area to the bottom right corner of the goal. Leicester 3-1 Barnsley. 56:35 The offside flag is raised against Frank Nouble. Free kick taken by Chris Weale. 51:17 Effort on goal by Richie Wellens from long range goes harmlessly over the bar. 50:04 Paul Gallagher takes a shot. Save by Luke Steele. 49:23 Yuki Abe gives away a free kick for an unfair challenge on Danny Haynes. Nathan Doyle takes the free kick. 48:06 Darius Vassell fouled by Diego Arismendi, the ref awards a free kick. Richie Wellens restarts play with the free kick. 47:01 Patrick Van Aanholt is caught offside. Indirect free kick taken by Luke Steele. 45:00+2:34 The half-time whistle blows. 45:00+0:33 Frank Nouble takes a shot. Clearance made by Ben Mee. 45:00+0:33 GOAL - Jacob Mellis:Leicester 2 - 1 Barnsley Jacob Mellis gets on the score sheet with a goal from the edge of the penalty area to the bottom right corner of the goal. Leicester 2-1 Barnsley. 44:33 The assistant referee flags for offside against Danny Haynes. Chris Weale takes the indirect free kick. 42:53 GOAL - Andy King:Leicester 2 - 0 Barnsley Andy King gets on the score sheet with a goal from inside the area to the top left corner of the goal. Leicester 2-0 Barnsley. 40:25 Kieran Trippier delivers the ball, Chris Weale makes a save. 37:43 Free kick awarded for a foul by Darius Vassell on Frank Nouble. Strike on goal comes in from Jacob Mellis from the free kick. 36:06 Bobby Hassell takes a shot. Save made by Chris Weale. 33:51 The referee penalises Kieran Trippier for handball. Shot comes in from Paul Gallagher from the free kick. 32:20 Corner taken by Jacob Mellis from the right by-line. 28:47 Jacob Mellis concedes a free kick for a foul on Kyle Naughton. Indirect free kick taken by Kyle Naughton. 28:47 Booking Jacob Mellis is given a yellow card. 27:50 The ball is swung over by Patrick Van Aanholt. 25:47 Unfair challenge on Danny Haynes by Yuki Abe results in a free kick. Luke Steele restarts play with the free kick. Correction - 24:29 Free kick awarded for an unfair challenge on Garry O'Connor by Ben Mee. Indirect free kick taken by Bobby Hassell. 24:29 Ben Mee gives away a free kick for an unfair challenge on Garry O'Connor. Bobby Hassell takes the free kick. 23:40 Free kick awarded for an unfair challenge on Paul Gallagher by Kieran Trippier. Chris Weale restarts play with the free kick. 22:32 Foul by Garry O'Connor on Yuki Abe, free kick awarded. Kyle Naughton takes the free kick. 20:48 Booking The referee books Diego Arismendi for unsporting behaviour. 19:44 Danny Haynes is caught offside. Chris Weale restarts play with the free kick. 15:42 Jacob Mellis takes the outswinging corner, Bobby Hassell produces a header from inside the area that goes over the crossbar. 14:31 GOAL - Paul Gallagher:Leicester 1 - 0 Barnsley Paul Gallagher grabs a goal from a long way out to the top left corner of the goal. 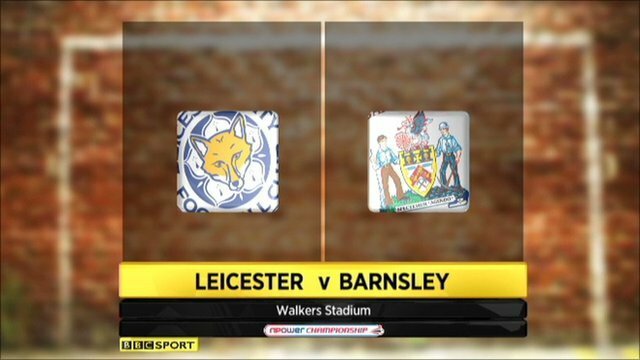 Leicester 1-0 Barnsley. 10:12 Danny Haynes is ruled offside. Chris Weale takes the free kick. 7:51 Yuki Abe concedes a free kick for a foul on Garry O'Connor. Bobby Hassell takes the free kick. 7:17 Free kick awarded for an unfair challenge on Yuki Abe by Jacob Mellis. Direct free kick taken by Ben Mee. 5:21 The assistant referee signals for offside against Frank Nouble. Chris Weale takes the indirect free kick. Correction - 2:44 Unfair challenge on Yuki Abe by Nathan Doyle results in a free kick. The free kick is swung in right-footed by Paul Gallagher. 2:44 Nathan Doyle challenges Yuki Abe unfairly and gives away a free kick. Free kick taken by Paul Gallagher.